Mad Science has amazing partnerships with some of the coolest restaurants and locations in the NY Metro area. Through our strategic partnership with Apple-Metro, Inc; the New York Metro Area Franchisee for casual dining leader, Applebee's Neighborhood Grill & Bar, Mad Science’s exciting programs are offered at all New York Metro Applebee’s locations Westchester County & the five boroughs. All options include customizable meal programs for unique party and event packages. To learn all about our amazing "Kitchen Chemistry" field trips for your school, camp or organization or, to find out how to plan an awesome Birthday Party complete with food and drink with no worries click the logo to the left. Have the sweetest birthday party ever! We've partnered with Dylan's Candy Bar, the largest candy store in the world, to create an unforgettable birthday party experience featuring all sorts of cool chemistry and sweet treats in an amazing party room that must be seen to be believed! To find out how to book your Sweet Lab Party package, please click the logo to the left. 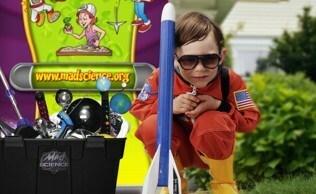 Mad Science has partnered with Ripley's Believe It Or Not! Times Square to create two amazing interactive experiences! Book us for our BRAND NEW assembly show, or book a truly one-of-a-kind birthday party! Whether we bring our special entertaining and engaging hands-on special event to your location, or if you bring your birthday party to them, experience unbelievable interactive exhibits and experiments! Your party will feature engaging, hands–on experiments that include things like tornado tubes, electricity experiments, chemical reactions that produce light, air pressure activities, indoor fireworks other great demonstrations. Take the tour through the heart of Times Square's wildest birthday party location to encounter spectacularly unique artifacts, and see astonishing curiosities. Plus you can learn more about our brand new Ripley's Believe It or Not show powered by Mad Science that can be brought right to your location! Click the logo to the left for details! Maybe a frosty sweet treat is more your thing? Well have we got a party for you. Your Mad Science party at our participating 16 Handles locations includes all the crazy laboratory fun you expect from Mad Science, but culminates with a Fro-Yo sundae making bar that is second to none! All of our parties include invitations, a poster for the birthday child, fun make-and-take chemistry experiments for all your guests and delicious frozen yogurt with tons of available toppings-yum! Click the logo to the left for more info. Looking for a taste of vintage NYC style? Then look no further than Big Daddy's! These New York City Diners are the perfect setting for a Mad Science party. With three locations to choose from, a great rock n' roll soundtrack, delicious food, amazing party packages, and of course balloons, you can't go wrong with Mad Science at Big Daddy's! Click the logo on the left for locations and booking information. Come discover the fun side of science during your Mad Science Party at the Art Farm! Our real Mad Scientist will lead demonstrations including chemical magic, movie special effects, and amazing bubbling potions. Each guest creates super-stretchy Mad Science Slime! After wards, you will get to spend some time in the Art Farm’s award-winning petting zoo to visit their animal friends! Need to know more? Click on the logo to the left. Mad Science is proud to partner with one of the coolest growing chains around, Peachwave Froyo! 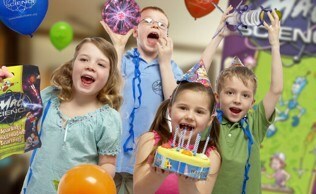 Peachwave is happy to plan with you and create a custom party that is a blast! They will provide group pricing and coordinate with Mad Science to create the perfect package to fit your needs. With four locations throughout Westchester, Peachwave is the perfect setting for an unforgettable Mad Science birthday party! Click the logo on the left for more information.